There are many different fillings for stuffed vine leaves. This one is meat free, and is best served cold as a starter. Vine leaves take time to prepare, but are not difficult. Prepackaged vine leaves come preserved in citric acid and salt. They must be rinsed well otherwise the finished dish does not taste right. Place the rice into a large bowl. If you cannot find medium grain rice you can substitute with basmati or short grained rice. Finely chop the onion and rub it with the salt and pepper. Add the onion to the rice. Finely chop the parsley and mint, and add them to the mix. Pour in 1/4 cup each of oive oil and lemon juice and mix well. Rinse the vine leaves thoroughly, and put any torn ones to one side. Do not discard them as you will line the pan with them later. Roll the vine leaves following the instructions given in How To Stuff Vine Leaves. Place a layer of torn or unused vine leaves on the bottom of the saucepan. On top of this layer add raw thinly sliced potato, or chopped celery stalks. These prevent the vine leaves from sticking to the bottom of the pan. Place the stuffed vine leaves in the pan, in a circular pattern, completing an entire layer before adding more. Pour over 1 cup of water, 1/4 cup of olive oil and 1/4 cup of lemon juice. Place a saucer or small plate on top of the stuffed vine leaves, to weigh them down. Cover the pan and bring it to the boil. Lower the heat and cook for 35-40 minutes, or until all of the liquid is absorbed. If, after 40 minutes there is still liquid in the pan, turn off the heat and drain the excess liquid. Remove the weight and allow to cool in the pan for about five minutes, before turning out. To turn out use a plate bigger than the top of the saucepan. Place the plate over the pan, face down. Then invert the pan and plate leave them that way for about five to ten minutes. Then gently remove the pan, and the vine leaves should retain their shape. This sounds much easier than it actually is, and it takes practice to get right. Don't worry if you can't manage it. 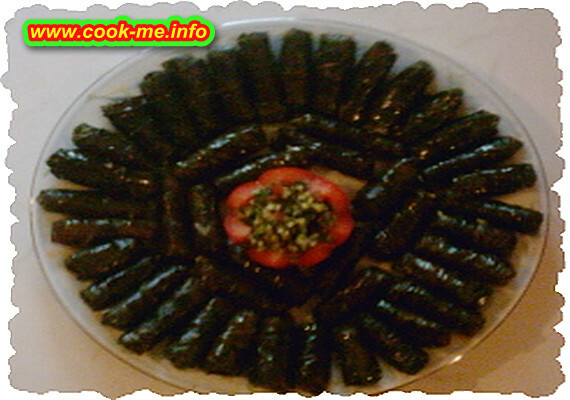 Just arrange the vine leaves on a plate, and decorate with lemon wedges or tomato. Although these are good to eat immediately, while they are still warm, they are even better if they are allowed to cool first.